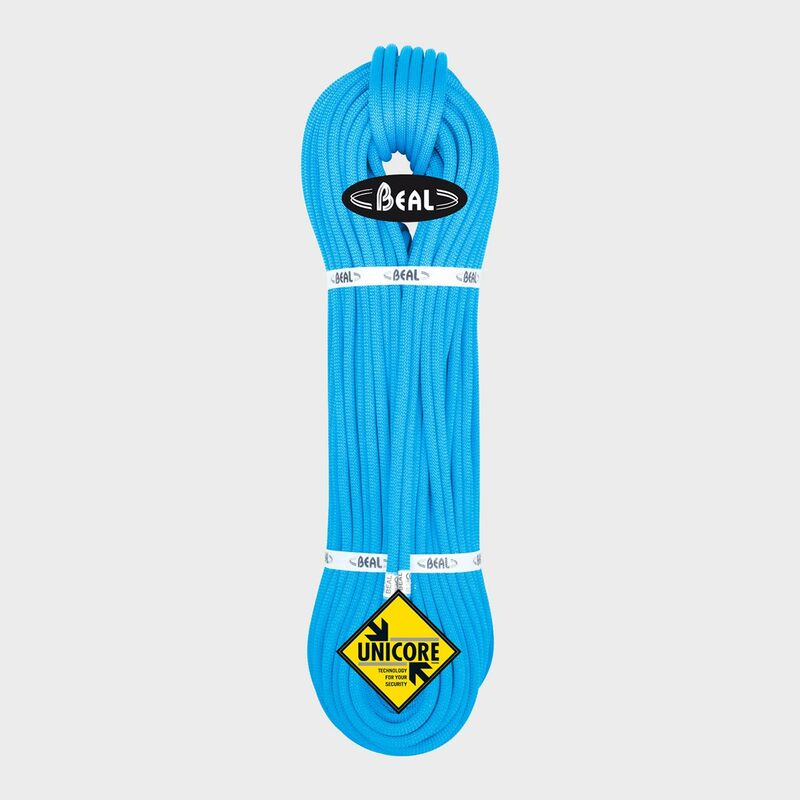 The Beal Opera 8.5mm Dry Cover is a top spec triple-certified climbing rope for advanced sport climbing, ice climbing and mountaineering in mild to moderate weather conditions. The Beal Opera 8.5mm Dry Cover is rated as a single, twin and double rope and offers on-point handling, minimal sheath slippage and superb weather protection thanks to Beal's unique Unicore construction and Dry Cover treatment. A little cheaper than the Opera Golden Dry, this rope is ideal for climbers who don't want to be climbing in extreme weather conditions, but still want the performance and handling of a treated rope; the Opera is also one of the lightest triple-certified ropes on the market, weighing in at only 48g per metre and making it a true multi-discipline rope for the expert climber. The Beal Opers 8.5mm Dry Cover features Beal's Dry Cover treatment, which is where the sheath of the rope is treated to resist water and dirt. While it's not as extensively treated as Beal's Golden Dry, it improves the longevity and handling of the rope and provides the perfect amount of protection for climbing and mountaineering in moderate to mild weather. The Beal Opera 8.5mm Dry Cover Rope features Beal’s unique Unicore Technology, which bonds the sheath and the core of the rope together, drastically reducing sheath slippage and making your rope much safer to use. The Unicore Treatment means that you can still safely rappel or abseil to safety if the sheath of your rope gets cut, as it won’t slip or bunch up, which causes it to become impossible to pass through your descender. The definition of "versatile" in a triple rated package of awesomeness. An absolutely great rope. Versatile and extremely light, Beal have really outdone themselves. I love this rope, but I'll get the negatives out of the way first. Two concerns have arisen since I started using mine: Firstly, you get a lot of funny looks and people asking if it's a single rated rope. Secondly, and more importantly, the speed of rope being pulled through when belaying somebody off of a climb is very fast and needs to be controlled with attention and an appropriate belay device. With the negatives finished, lets go on to positives. The Opera excels at what it's designed to do, which is be the lightest triple rated rope on the market. This really shows when you're coiling 60m or you're dragging it up a long pitch. The treatment of the rope means it stays water free throughout any outdoor climbing. Simply put, I love this rope and for this price it's an unmissable bargain.